For the CBS presented Stevie Wonder: Songs in the Key of Life — An All-Star Grammy Salute. Stars celebrated the works of Stevie Wonder. The show started off with an A-List Vocal lineup. Including Beyoncé Lady Gaga, Pharrell Williams, Ed Sheeran, Ariana Grande, Janelle Monáe, John Legend and Gary Clark Jr.
Beyoncé kicked off the celebration with a performance of “Fingertips,” Wonder’s first No. 1 single in 1963. 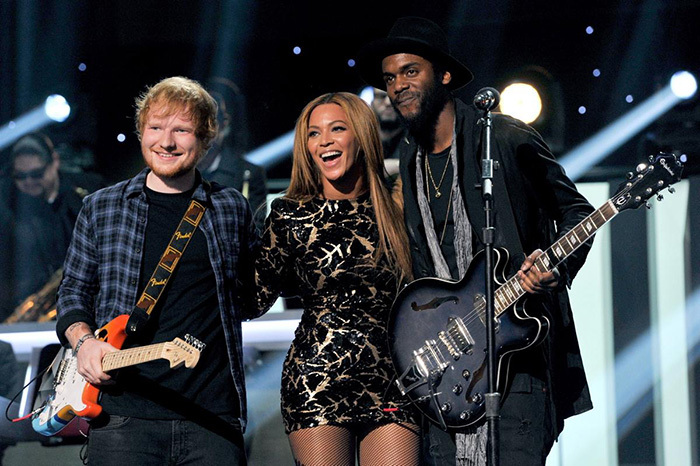 She went “Jammin’” with Ed Sheeran before taking it to “Higher Ground” with fellow Houston native Gary Clark Jr.
Beyoncé started the tribute with performances of “Fingertips,” “Jammin’” feat. Ed Sheeran & “Higher Ground” with fellow Houston native Gary Clark Jr.
← Christina Aguilera, Nas, Ariana Grande & Nicki Minaj Rock Out NBA All-Star Game!